This therapy targets the sympathetic nervous system, a series of nerves that spread out from your spine to your body to help control several involuntary body functions. These include blood flow, digestion, urination, sweating and sexual arousal. Your sympathetic nerves come together outside your spine area in thick networks of nerves called ganglions. When these nerves are irritated or injured, the blood supply to your hands, feet, or other areas may be affected and can produce pain or sensory changes. Headaches, neck pain, and facial pain can also be seen in patients who have sympathetic nerve dysfunction. 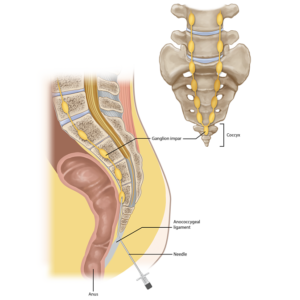 A sympathetic nerve block involves injecting a local numbing anesthetic and a corticosteroid into the space where the sympathetic nerve ganglion is located. The entire procedure takes less than 15minutes and x-ray guidance is used to ensure proper needle position.